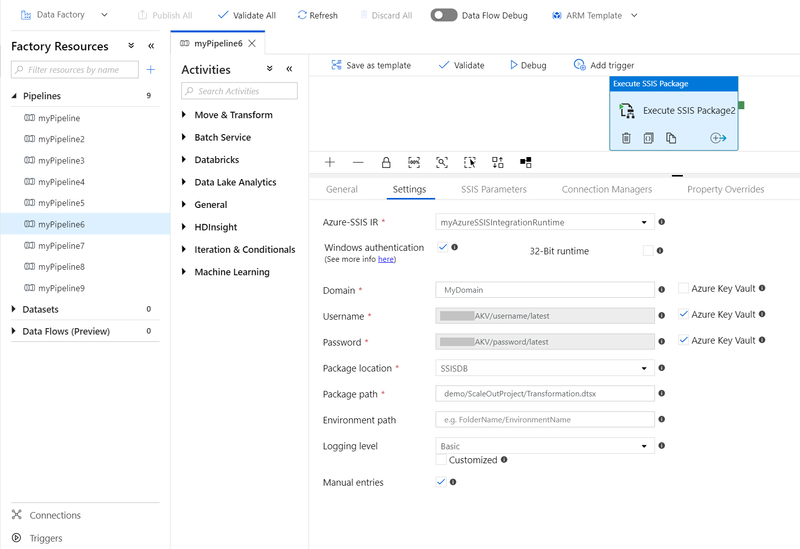 This article describes how to run an SSIS package in Azure Data Factory (ADF) pipeline by using the Execute SSIS Package activity. 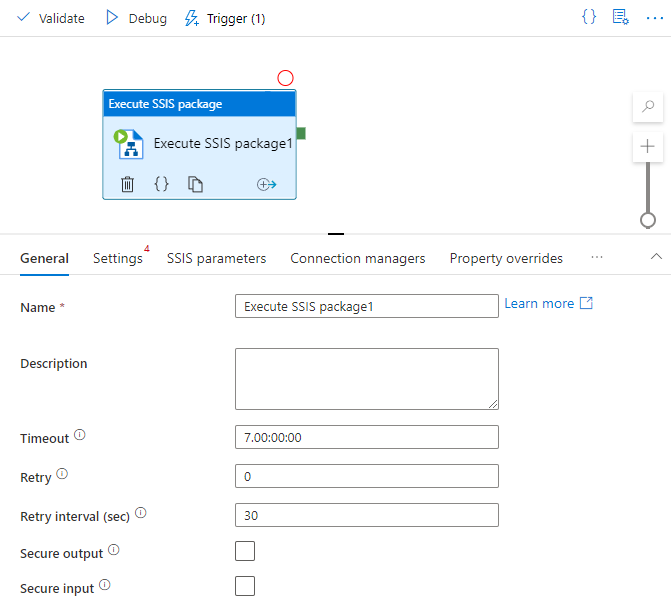 Create an Azure-SSIS Integration Runtime (IR) if you do not have one already by following the step-by-step instructions in the Tutorial: Deploy SSIS packages to Azure. In this section, you use ADF User Interface (UI)/app to create an ADF pipeline with Execute SSIS Package activity that runs your SSIS package. In this step, you use ADF UI/app to create a pipeline. 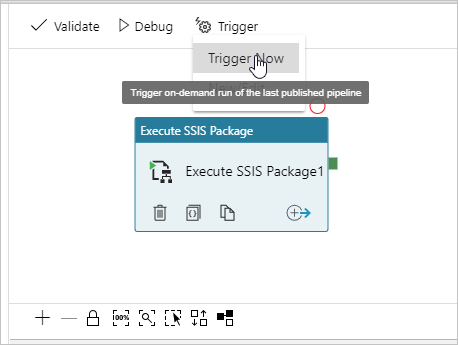 You add an Execute SSIS Package activity to the pipeline and configure it to run your SSIS package. 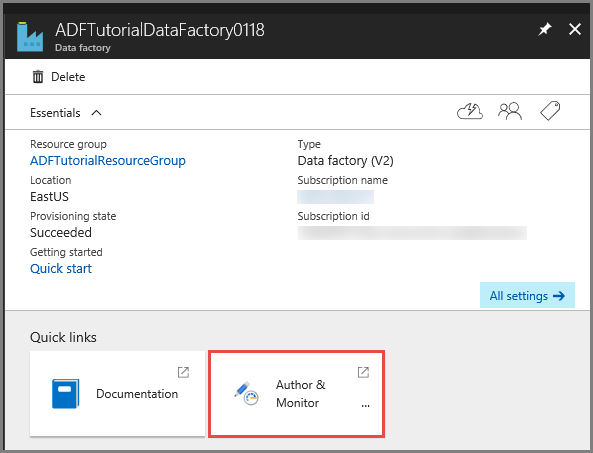 On your ADF overview/home page in Azure portal, click on the Author & Monitor tile to launch ADF UI/app in a separate tab. In the Activities toolbox, expand General, then drag & drop an Execute SSIS Package activity to the pipeline designer surface. On the General tab for Execute SSIS Package activity, provide a name and description for the activity. Set optional timeout and retry values. 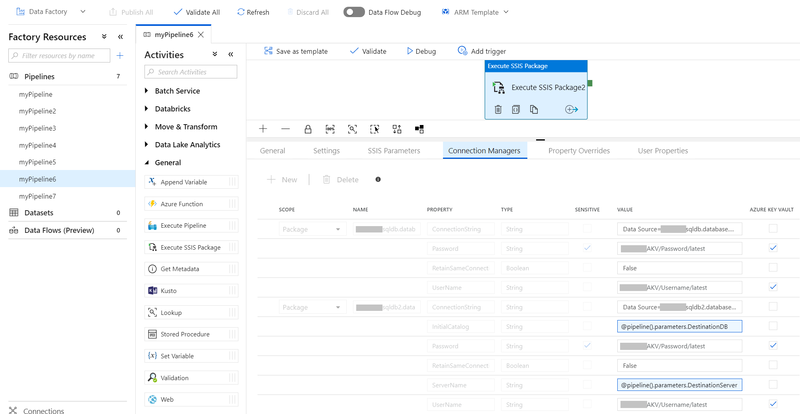 On the Settings tab for Execute SSIS Package activity, select your Azure-SSIS IR that is associated with SSISDB database where the package is deployed. If your package uses Windows authentication to access data stores, e.g. SQL Servers/file shares on premises, Azure Files, etc., check the Windows authentication checkbox and enter the domain/username/password for your package execution. If your package needs 32-bit runtime to run, check the 32-Bit runtime checkbox. For Logging level, select a predefined scope of logging for your package execution. Check the Customized checkbox, if you want to enter your customized logging name instead. When your Azure-SSIS IR is running and the Manual entries checkbox is unchecked, you can browse and select your existing folders/projects/packages/environments from SSISDB. Click the Refresh button to fetch your newly added folders/projects/packages/environments from SSISDB, so they are available for browsing and selection. When your Azure-SSIS IR is not running or the Manual entries checkbox is checked, you can enter your package and environment paths from SSISDB directly in the following formats: <folder name>/<project name>/<package name>.dtsx and <folder name>/<environment name>. On the SSIS Parameters tab for Execute SSIS Package activity, when your Azure-SSIS IR is running and the Manual entries checkbox on Settings tab is unchecked, the existing SSIS parameters in your selected project/package from SSISDB will be displayed for you to assign values to them. Otherwise, you can enter them one by one to assign values to them manually – Please ensure that they exist and are correctly entered for your package execution to succeed. You can add dynamic content to their values using expressions, functions, ADF system variables, and ADF pipeline parameters/variables. Alternatively, you can use secrets stored in your Azure Key Vault (AKV) as their values. To do so, click on the AZURE KEY VAULT checkbox next to the relevant parameter, select/edit your existing AKV linked service or create a new one, and then select the secret name/version for your parameter value. When you create/edit your AKV linked service, you can select/edit your existing AKV or create a new one, but please grant ADF managed identity access to your AKV if you have not done so already. You can also enter your secrets directly in the following format: <AKV linked service name>/<secret name>/<secret version>. On the Connection Managers tab for Execute SSIS Package activity, when your Azure-SSIS IR is running and the Manual entries checkbox on Settings tab is unchecked, the existing connection managers in your selected project/package from SSISDB will be displayed for you to assign values to their properties. Otherwise, you can enter them one by one to assign values to their properties manually – Please ensure that they exist and are correctly entered for your package execution to succeed. You can add dynamic content to their property values using expressions, functions, ADF system variables, and ADF pipeline parameters/variables. Alternatively, you can use secrets stored in your Azure Key Vault (AKV) as their property values. 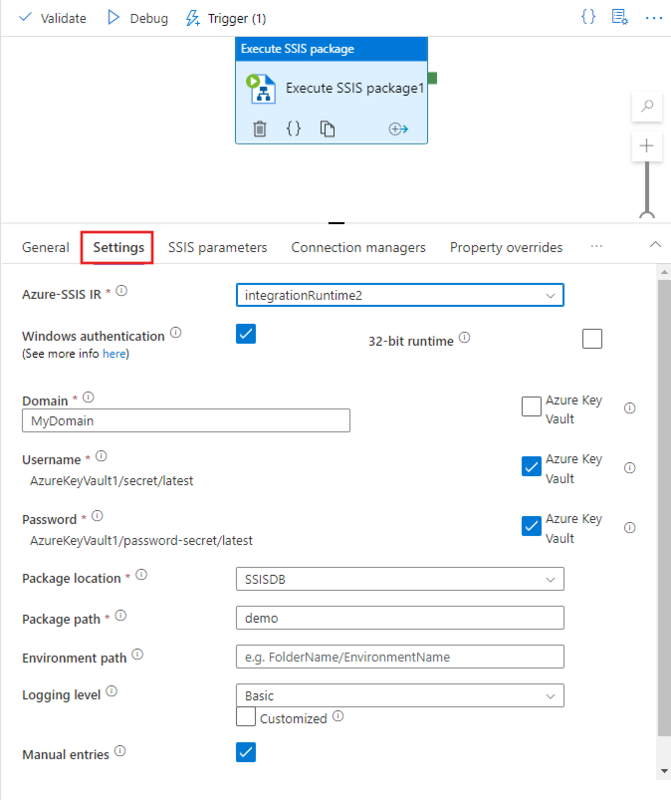 To do so, click on the AZURE KEY VAULT checkbox next to the relevant property, select/edit your existing AKV linked service or create a new one, and then select the secret name/version for your property value. When you create/edit your AKV linked service, you can select/edit your existing AKV or create a new one, but please grant ADF managed identity access to your AKV if you have not done so already. You can also enter your secrets directly in the following format: <AKV linked service name>/<secret name>/<secret version>. On the Property Overrides tab for Execute SSIS Package activity, you can enter the paths of existing properties in your selected package from SSISDB one by one to assign values to them manually – Please ensure that they exist and are correctly entered for your package execution to succeed, e.g. to override the value of your user variable, enter its path in the following format: \Package.Variables[User::YourVariableName].Value. You can also add dynamic content to their values using expressions, functions, ADF system variables, and ADF pipeline parameters/variables. To validate the pipeline configuration, click Validate on the toolbar. To close the Pipeline Validation Report, click >>. Publish the pipeline to ADF by clicking Publish All button. In this step, you trigger a pipeline run. To trigger a pipeline run, click Trigger on the toolbar, and click Trigger now. In the Pipeline Run window, select Finish. Switch to the Monitor tab on the left. You see the pipeline run and its status along with other information (such as Run Start time). To refresh the view, click Refresh. Click View Activity Runs link in the Actions column. You see only one activity run as the pipeline has only one activity (the Execute SSIS Package activity). You can run the following query against the SSISDB database in your Azure SQL server to verify that the package executed. You can also get the SSISDB execution ID from the output of the pipeline activity run, and use the ID to check more comprehensive execution logs and error messages in SSMS. You can also create a scheduled trigger for your pipeline so that the pipeline runs on a schedule (hourly, daily, etc.). 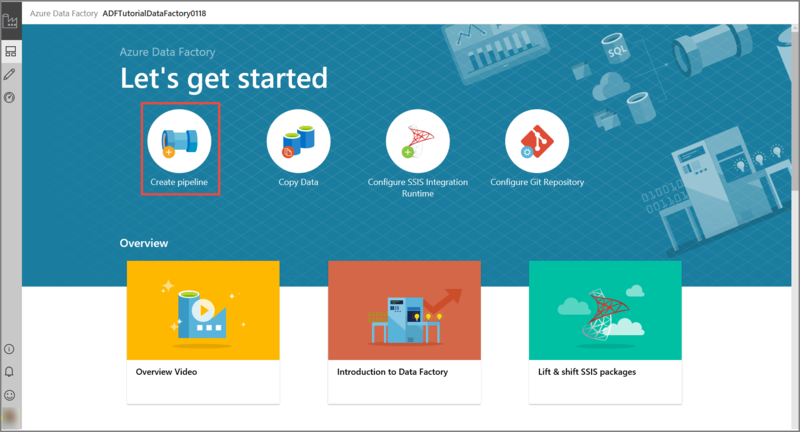 For an example, see Create a data factory - Data Factory UI. 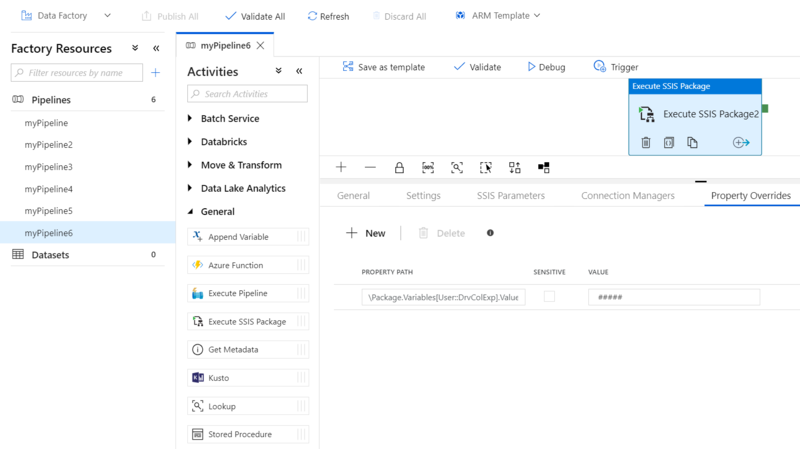 In this section, you use Azure PowerShell to create an ADF pipeline with Execute SSIS Package activity that runs your SSIS package. Install the latest Azure PowerShell modules by following the step-by-step instructions in How to install and configure Azure PowerShell. 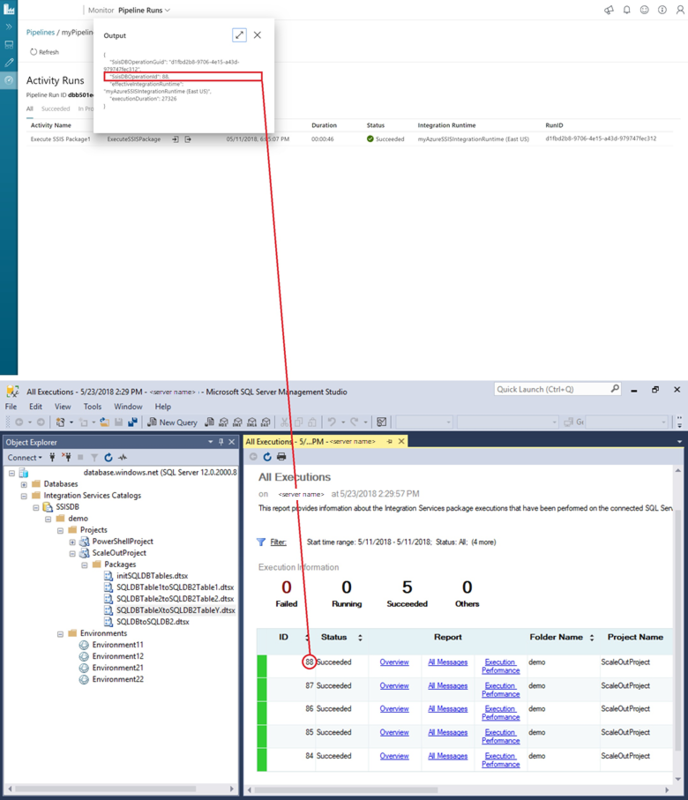 You can either use an existing ADF that already has Azure-SSIS IR provisioned or create a new ADF with Azure-SSIS IR following the step-by-step instructions in the Tutorial: Deploy SSIS packages to Azure via PowerShell. In this step, you create a pipeline with an Execute SSIS Package activity. The activity runs your SSIS package. Replace object names, descriptions, and paths, property and parameter values, passwords, and other variable values before saving the file. In Azure PowerShell, switch to the C:\ADF\RunSSISPackage folder. To create the pipeline RunSSISPackagePipeline, run the Set-AzDataFactoryV2Pipeline cmdlet. Use the Invoke-AzDataFactoryV2Pipeline cmdlet to run the pipeline. The cmdlet returns the pipeline run ID for future monitoring. Run the following PowerShell script to continuously check the pipeline run status until it finishes copying the data. Copy/paste the following script in the PowerShell window, and press ENTER. Write-Output  "Pipeline is running...status: InProgress"
You can also monitor the pipeline using the Azure portal. For step-by-step instructions, see Monitor the pipeline. In the previous step, you ran the pipeline on-demand. You can also create a schedule trigger to run the pipeline on a schedule (hourly, daily, etc.). Run the Set-AzDataFactoryV2Trigger cmdlet, which creates the trigger. By default, the trigger is in stopped state. Start the trigger by running the Start-AzDataFactoryV2Trigger cmdlet. Confirm that the trigger is started by running the Get-AzDataFactoryV2Trigger cmdlet. Run the following command after the next hour. For example, if the current time is 3:25 PM UTC, run the command at 4 PM UTC.